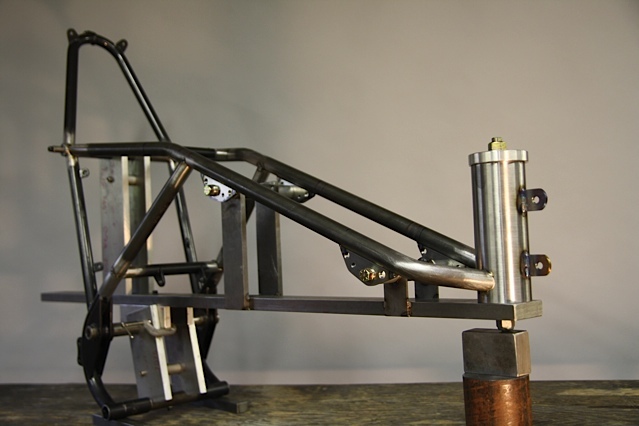 Ruby Racer 2.0 - Motorcycle Rebuild by Paul BrodieFlashback Fabrications Ltd. This is what Ruby looked like after the last race (September 2012). She had evolved over 4 seasons at the track and in the Excelsior Factory Race Shop, and she had become more complex than originally planned. 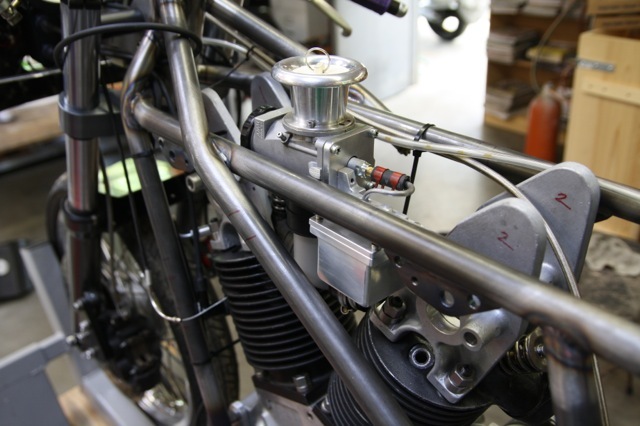 For example, does a race bike really need two oil tanks? Absolutely not. And so, I took her apart to begin the long-awaited make-over. You can clearly see the frame here. This will now be known as the “Mk.1” version. I did feel a little sad about what I was going to do next . 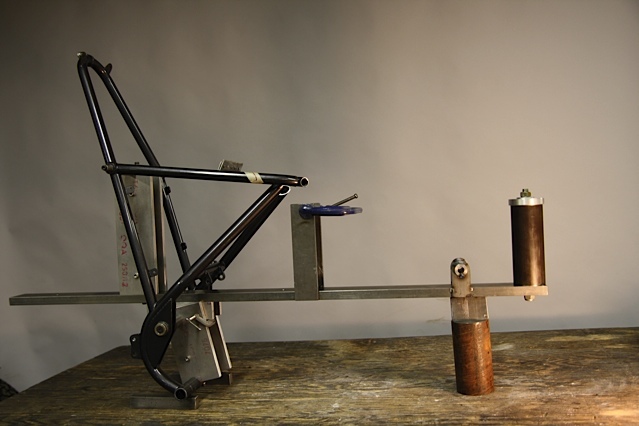 . .
Frame is in the jig. Held in the jig, I cut off the front half with a hacksaw. The new head tube has been bolted in place. Andrew Schuil at Pacific Bending in Maple Ridge took care of the different bends. 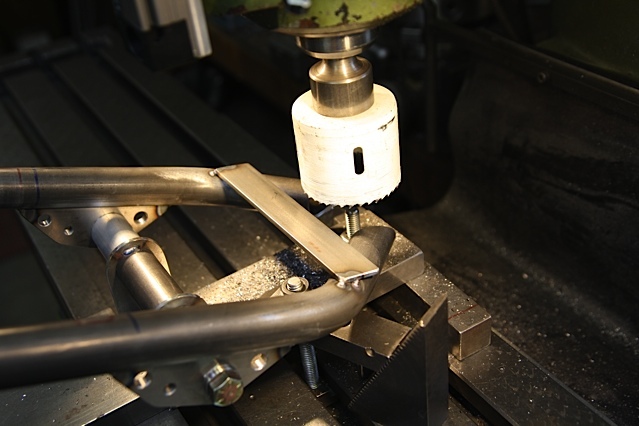 I chose 4130 tubing with a 1.0″ OD and a .095″ wall thickness. At this stage, I’m not sure what the final frame will look like. Andrew calls this “building as you go,” and I agree with that philosophy. I tig-tacked a strip of steel flat bar to help stop vibrations, then used a hole saw to cut the mitre for the head tube. 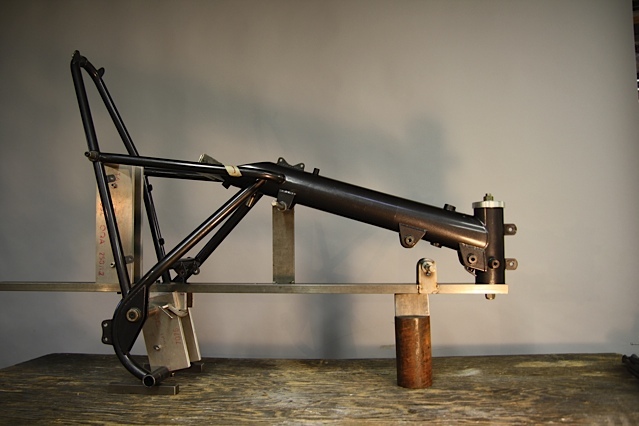 Frame is still firmly held in the jig. Hole saw spins at about 150 rpm. 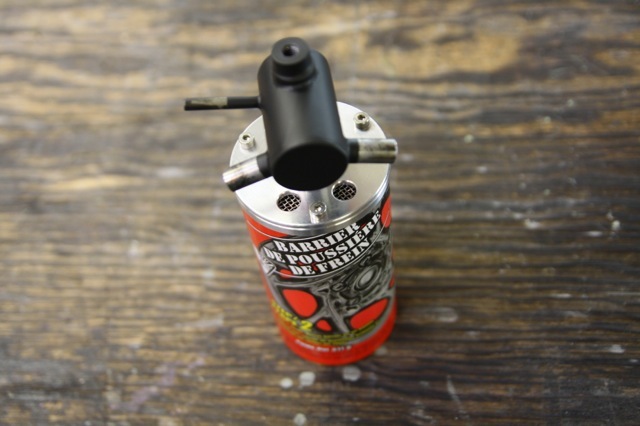 Insert the head tube and tig-tack in place. 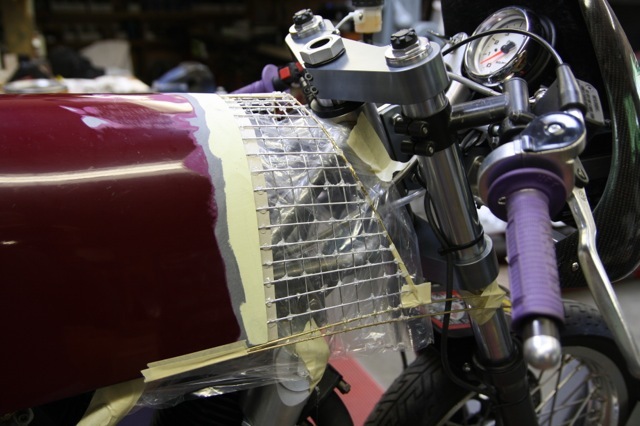 The instrument and fairing mounts have been added too. 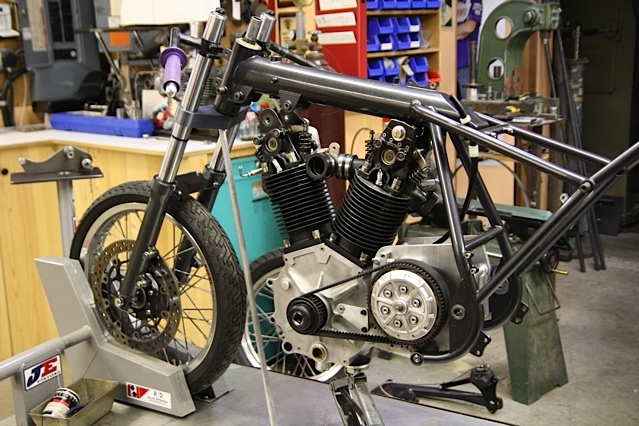 With the frame bolted to the motor and transmission, the diagonal side tubes are added. You can see where I want the carb to go. 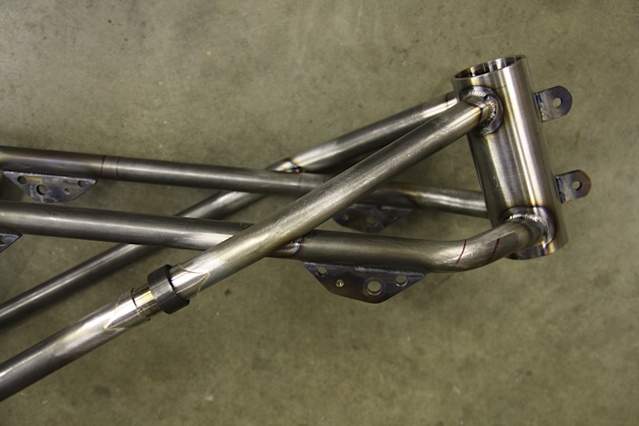 It took a few hours to tig-weld the frame. I think it will be quite strong. 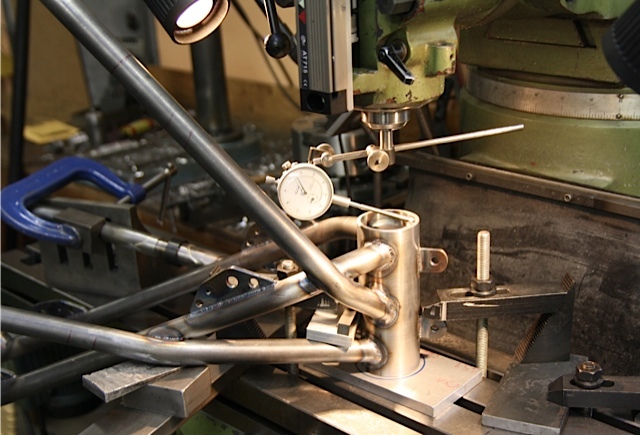 The welding is complete, so now the head tube is clamped to the milling machine table and the spindle is being dialed into the head tube. 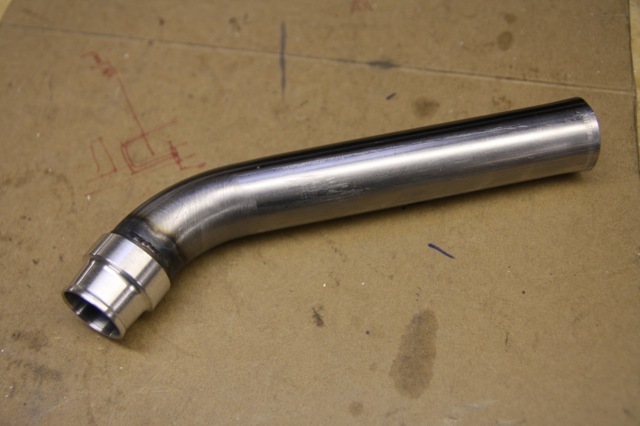 Nothing stays round after welding, therefore I need to bore the head tube for a small press fit to hold the headset bearings. 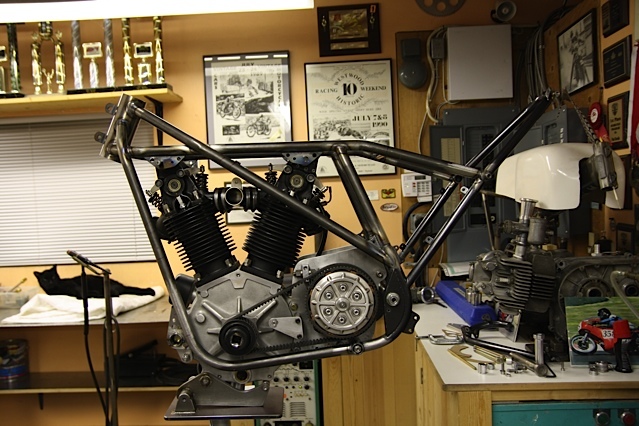 Headset bearings are installed, and the frame is done. That whole process took 88 hours. 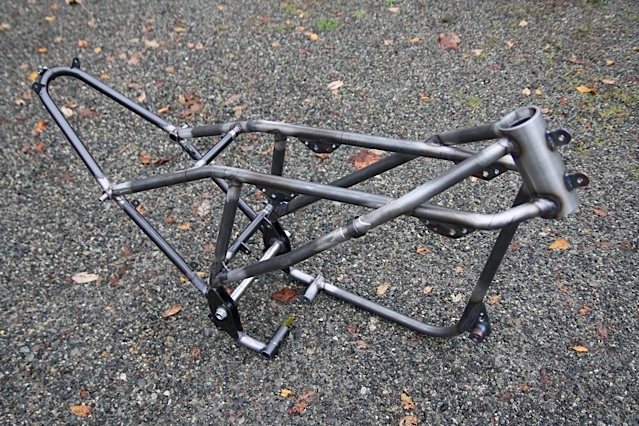 Is this the world’s first one-sided frame? I didn’t plan it that way at all . . .
And so, this is the start of Ruby 2.0 (2 point oh!). Ruby’s going to be new from the waist up. She’s very excited! I’ll keep you posted on my progress. Thanks for reading about Ruby. It has become a Race to get Ruby ready for her first race of the 2013 season. Ruby got a new frame last fall, but nothing else happened after that. Well, I did build eBee, went to Maui, and taught a Framebuilding 101 course, so . . .
For Ruby 2.0 to be race-ready, she needs a new oil tank, gas tank, remote float bowl, intake manifold, cam towers, and more. Everything takes time, and has to be right. Here’s how the oil tank came together. 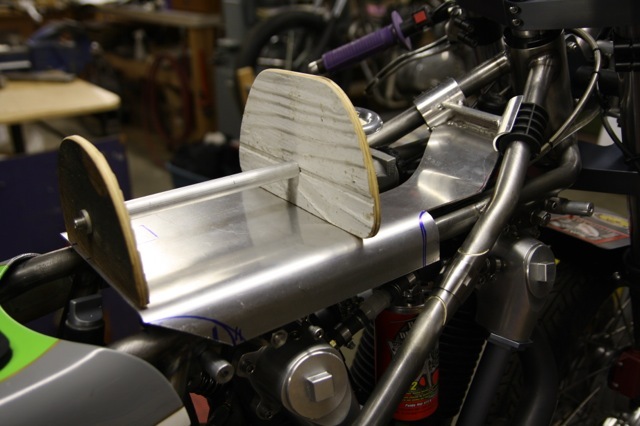 I used the English Wheel at UFV, and formed the section that faces the rear tire. This is my first attempt using an English Wheel. I watched the video, learned some basics, and that gave me a few clues. I’m far from an expert. To form this much probably took about 4 hours.. The wheel polishes the metal as it forms it. 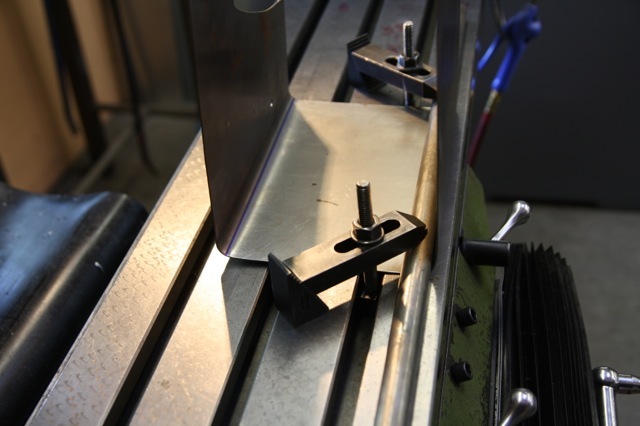 This is my improvised bender: I clamped the sheet metal to my milling machine table using a 3/4″ steel rod, then bent the sheet by hand. Looking inside the tank before the top is welded on. You can see the 2 return lines that enter the front, then end near the top of the tank, close to the middle. 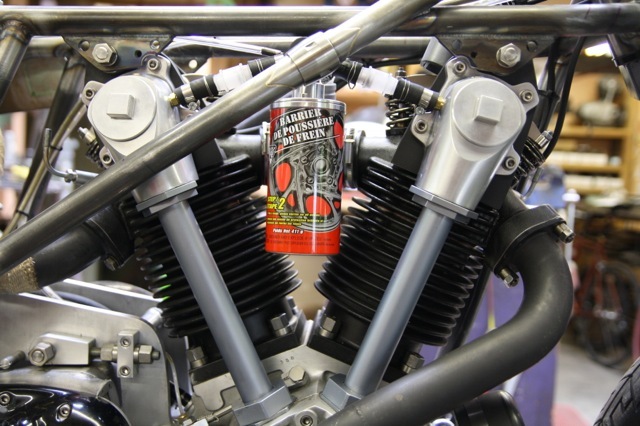 The ends of the tubes are above the oil level, so no oil drains back into the motor when the bike sits. This is Ruby’s finished oil tank. Much better than the 2 separate oil tanks on previous Ruby. Total build time was 26 hours. 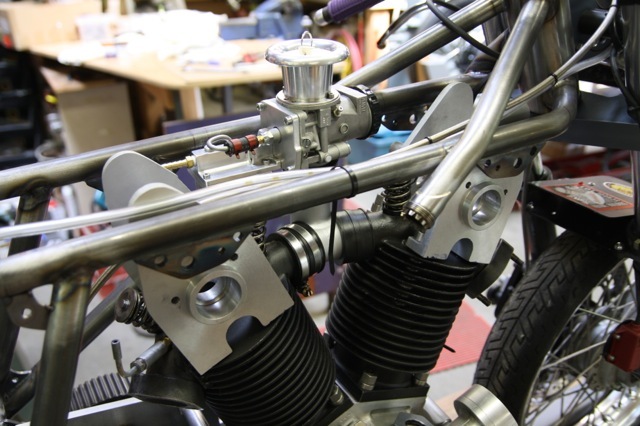 Ruby’s new frame means better access to her top end, but it also means her carb needs to be repositioned, and downdraft sounds very good. Downdraft meant a remote float bowl, but I did have a big chunk of aluminum handy. I didn’t have much of a drawing, just a sketch of how the float had to be positioned in relation to the needle and seat. I just fabricated it as I went along; a free-form way of creating things. I like this method a lot, because I never know what it’s really going to look like until it’s finally done. 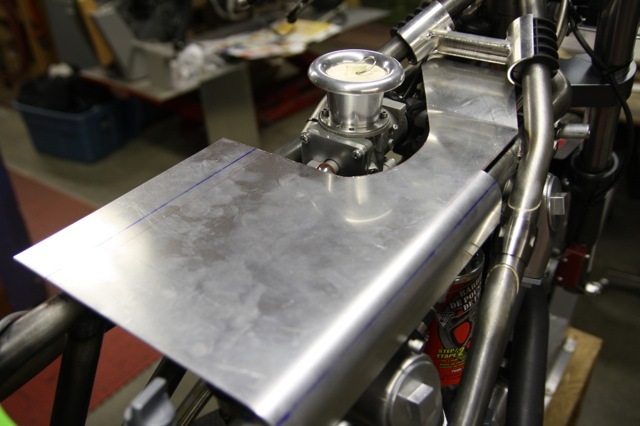 Here the carb body has a 1/4″ plate in place of the float bowl. 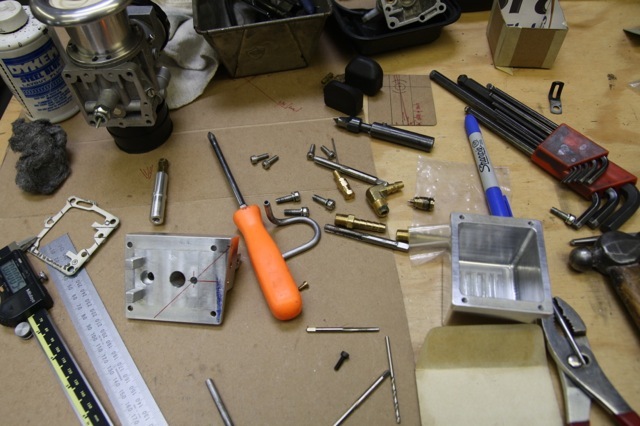 I have my parts: main jet, pilot jet, needle and seat, and float. The float bowl is mostly done, and now I’m working on the top. You can see the 2 posts that will hold the float, and the hole between them is for the needle and seat. This float bowl has a much bigger capacity than the stock Amal. There is also much less restriction getting the fuel into the float bowl. 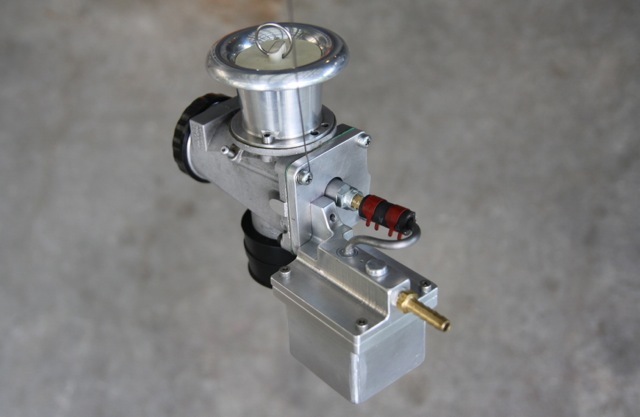 Hopefully, fuel starvation issues will be a thing of the past! This is what my work bench looks like when I’m in the thick of it. Milling the final shape for the top of the float bowl. Material is 6061 aluminum. Checking to see if it fits, and it does. 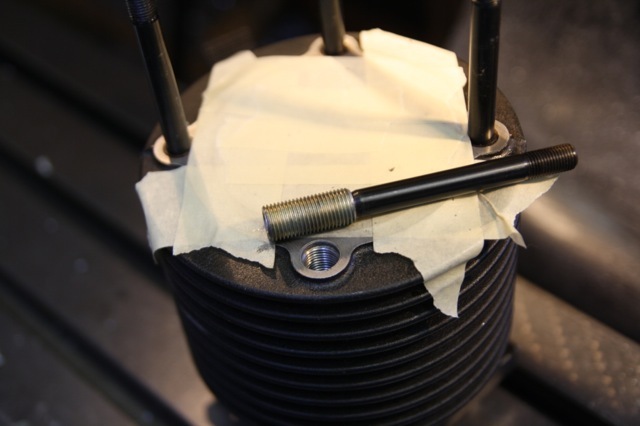 The new cam towers are in position to be marked for the engine bolts. View from the right side. Total time to modify the carb was 22 hours. If I had a regular 9-5 job, not much of this would have happened. I’ll keep working, and keep you upated. Thanks for reading about the new and improved Ruby. 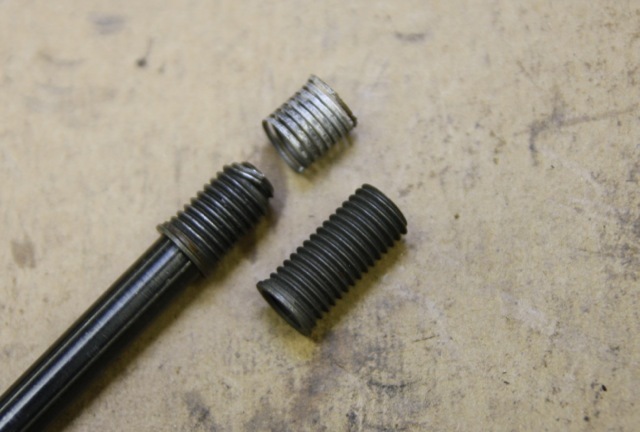 Taking off the cylinder heads, I discovered that another rear stud had pulled out of the rear head, despite having a Timesert insert. This was not what I wanted to find. The insert had broken in half, as you can see here. Above the broken Timesert is the aluminum pulled out of the barrel. 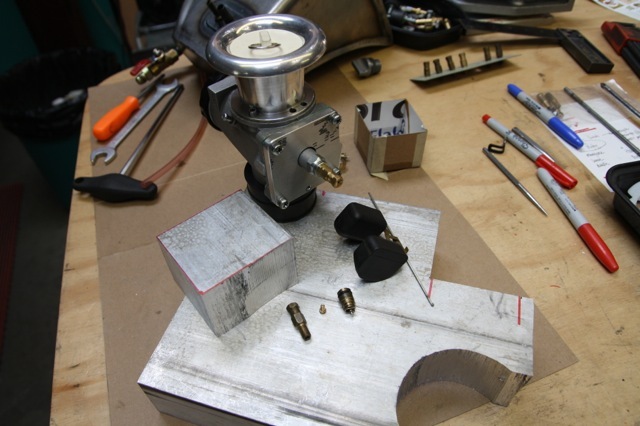 So, not much else to do except make my own insert from some Grade 8 1/2″ NF Redi-rod. 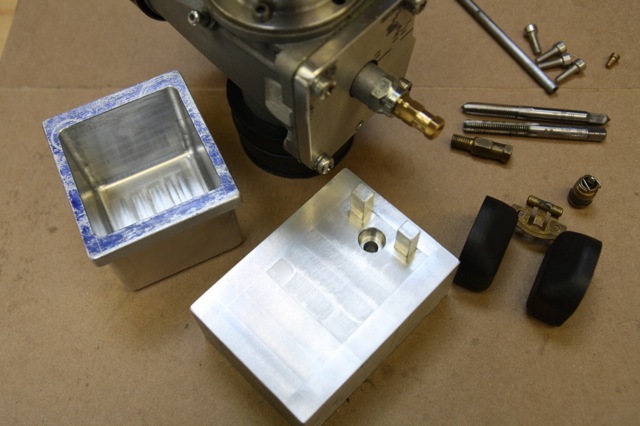 The rear head is getting too hot, and that softens the aluminum casting. Let’s hope the new ducting system is a good one. I will also richen the mixture to help with the cooling. I think the fuel starvation problem probably caused the engine to run quite hot. 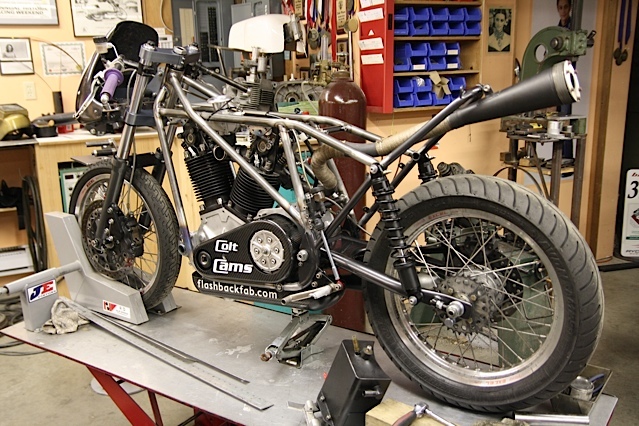 The new frame and intake system meant the tank cover would have to be modified at the front. I used the old existing “plug” for this. 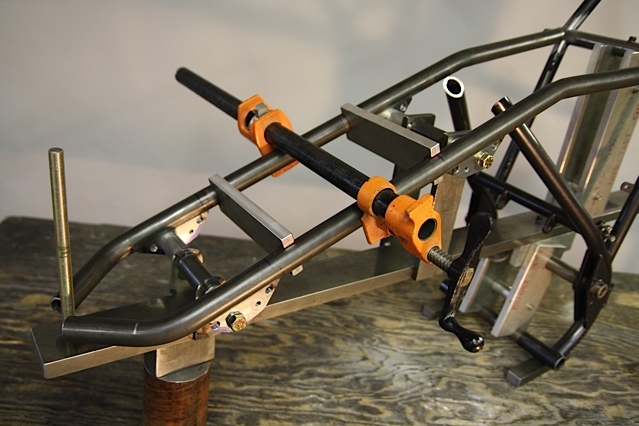 Here, the front has been removed with a diamond cutoff wheel and the new shape created with aluminum welding rods held together with a glue gun. 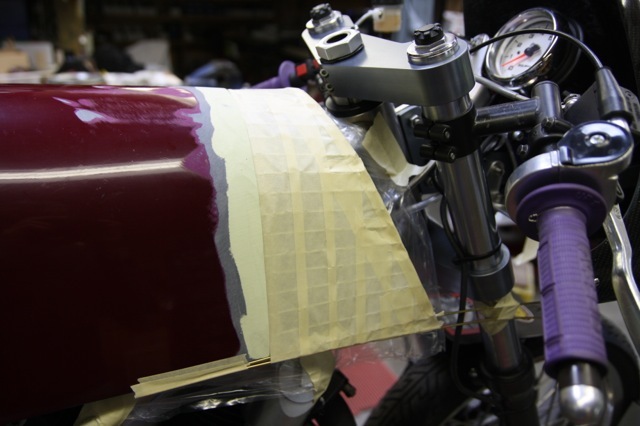 Masking tape covers this . 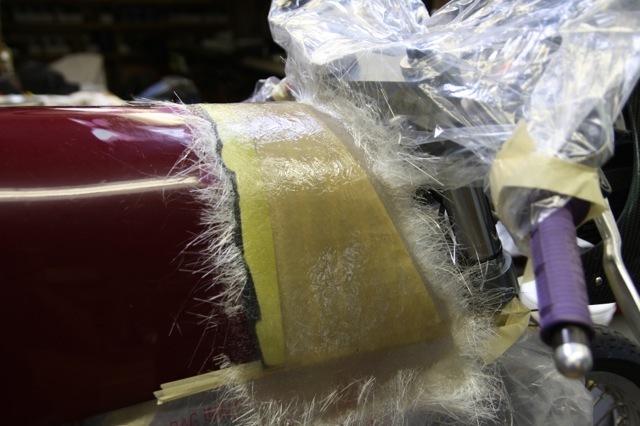 . .
and a few layers of fiberglass matt are laid up with regular polyester resin to finalize the basic shape. Ruby needed a new breather bottle. I haven’t had a lot of success with plastic containers; they usually either melt or crack. I had this very nice aluminum container that once held wheel cleaner. The writing is all in French. It had sat on a shelf in my shop for years, so it was time to use it. It was too long, so I shortened it and made a fancy aluminum top that has 6 vent holes, complete with fine stainless steel mesh. I held them together with Loctite. Only the best for Ruby! 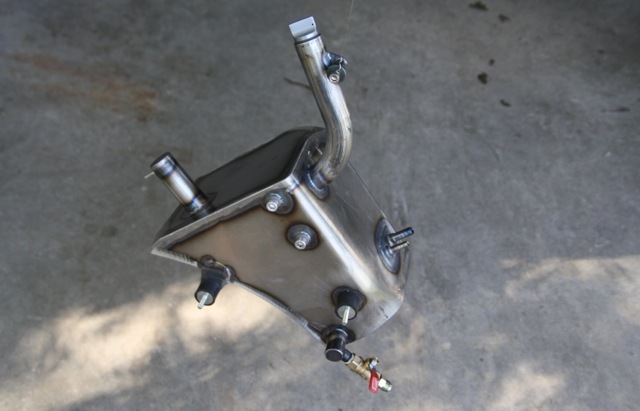 Here it is, mounted, with the Bunn Breathers hooked up from the front and rear bevel drive towers. I may spray the breather can black; I haven’t decided yet. The frame still has to be painted, and you can see the S&S coupling where the frame comes apart. This is the start of the gas tank which will sit under the fiberglass cover. 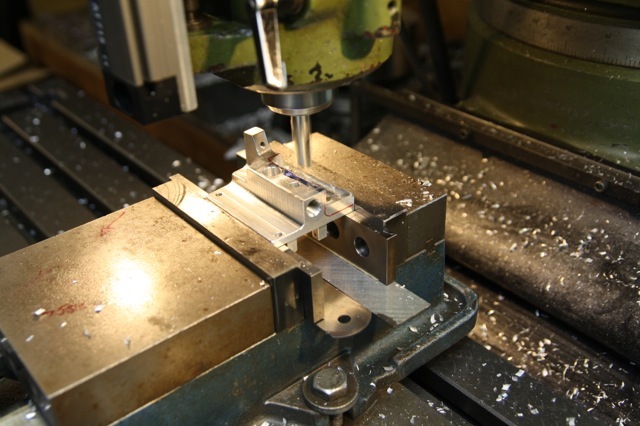 I’m using 3003 aluminum, .080″ thick. 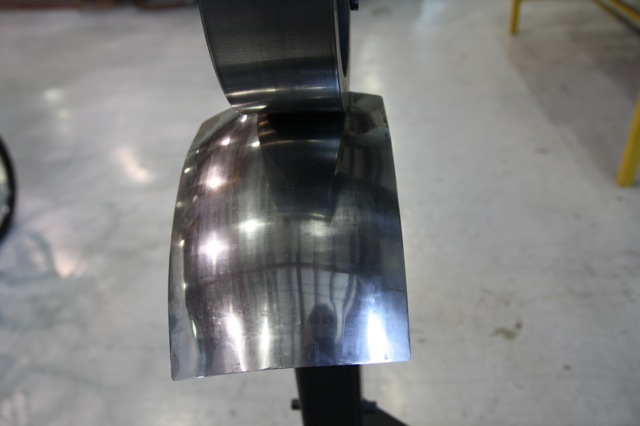 It’s harder to weld than 6061. The tank top needed to be formed, so I made a couple of thin plywood templates for this purpose. 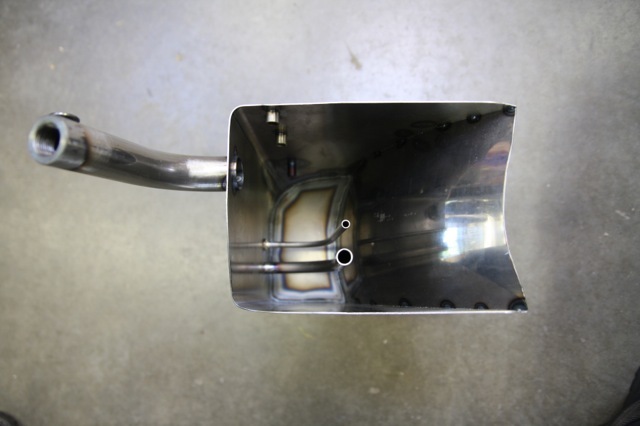 Start of the duct that will carry cool air to the rear cylinder head. 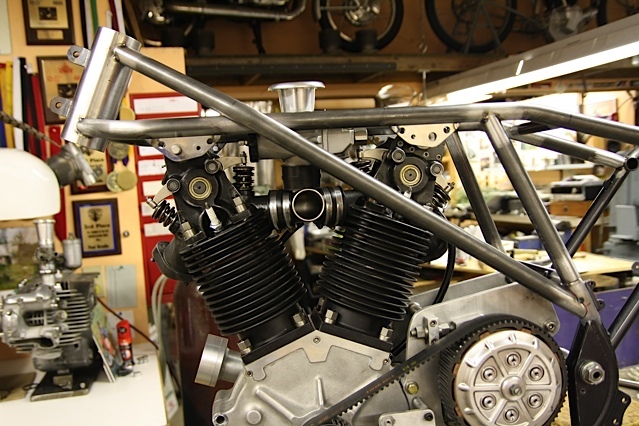 Top view of the frame showing approximately where the air duct will be mounted. I have decided that the gas tank and the air duct will be joined together, but haven’t figured out quite how to make that happen. The air duct is rubber mounted up front, and the gas tank is rubber mounted at the rear. 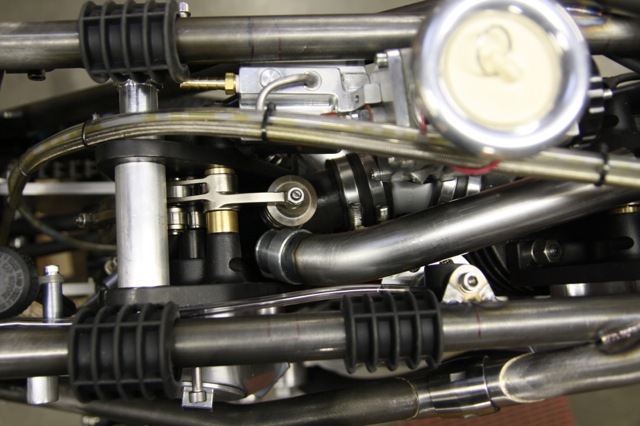 They come off simultaneously for good access to the valve train. That’s my Big Idea. How long can that take to create? We’ll see. 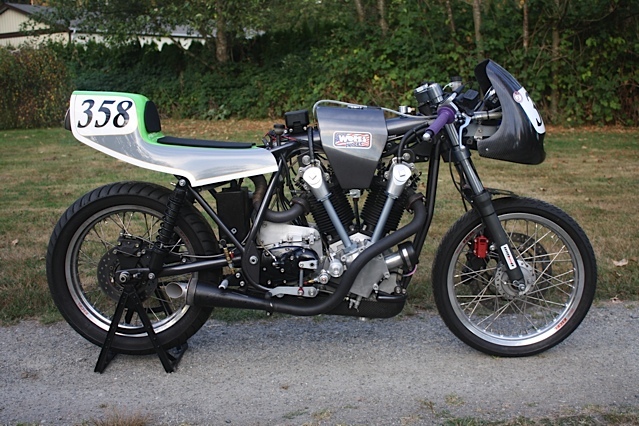 The following video is at the Dyno with Paul Brodie’s Excelsior road racer at Cypress Motorbikes, Delta BC Canada.